Back in 2006 Holidaysafe travel insurance was launched (with a very purple website), and since then we’ve launched two new websites, insured over 900,000 travellers and been voted ‘Most Trusted Travel Insurance Provider of the Year 2016’ plus ‘Travel Insurance Provider of the Year 2014 & 2016’. Birthdays make us feel reflective here at Holidaysafe HQ, so to celebrate turning 10, we want to share some of the things we’ve been up to since 2006 – so we created a handy infographic and short video. Holidaysafe wouldn’t be where it is today without our amazing customers, who repeatedly leave us fantastic feedback on Trust Pilot and return year after year, so as a thank you, we’re offering every Holidaysafe customer 20%* off their next travel insurance policy until December 2016. Simply visit Holidaysafe.co.uk, click ‘get a quote’ on your chosen policy type and then enter discount code ‘HSBDAY’. 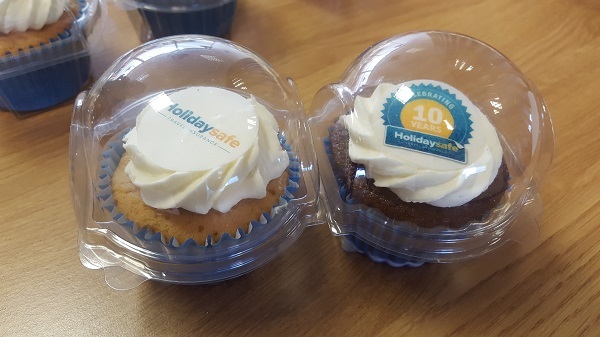 As we’re still in peak holiday season, every department has been extremely busy here at Holidaysafe HQ, but we did have time for a quick celebration with a cupcake or two. Once again I would just like to thank all of our customers for their support over the years, and we hope to continue insuring your travels for decades to come.